To say that Tin Man Games are a busy bunch would be an understatement. See, not only are they working on bringing their reimagining of The Warlock of Firetop Mountain to Switch, but just recently, the desktop version of Fighting Fantasy Classics saw the light of day too. No time like the present to be a Fighting Fantasy fan, that’s for sure, and hey… first one’s free! Now, seeing how some of these have been on Steam for some time now – including House of Hell, which I reviewed back in 2014! – this may seem like an odd re-release of sorts to some. It really isn’t though. Fighting Fantasy Classics, for all intents and purposes, is a huge improvement over the original batch of Fighting Fantasy titles ported/digitized(?) by Tin Man Games in the past, and not just because of the lower price tag either. No, the engine running these ancient gamebooks has several exclusive (and quite frankly, very groovy!) features, including a map. Yes, a map. An incredibly useful map, considering how unforgiving some of these titles can be – and that’s one thing which has not changed from the source material. I mean, you could always enable ‘free read’ mode, at which point any challenge will be removed. But I’d strongly recommend against that for your first attempt – or several – as it would undeniably color initial impressions. Speaking of which… my initial attempt at even reaching Cinnabar, the dread pirate lord in Bloodbones did not exactly go according to plan. Maybe you’ll fare better though? 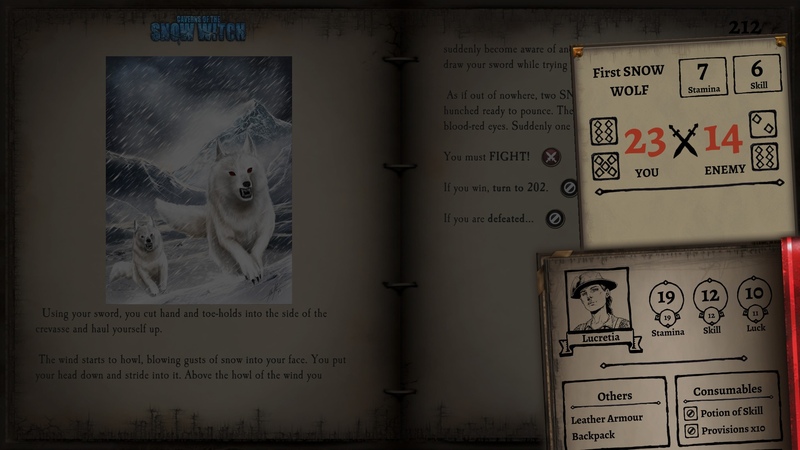 Won’t cost a cent to try at least, as that gamebook comes with Fighting Fantasy Classics, which is free. On top of that, Fighting Fantasy fans are bound to appreciate another inclusion in this collection/library: a history of the franchise! I certainly enjoyed reading through that, having read/played the books since… well, since The Citadel of Chaos was (relatively) new. Time flies! Oh, and for those who prefer the original artwork/page design, actual rolling dice, etc. – don’t worry. All that’s included, and more, ensuring most will be able to find a configuration to suit their needs. 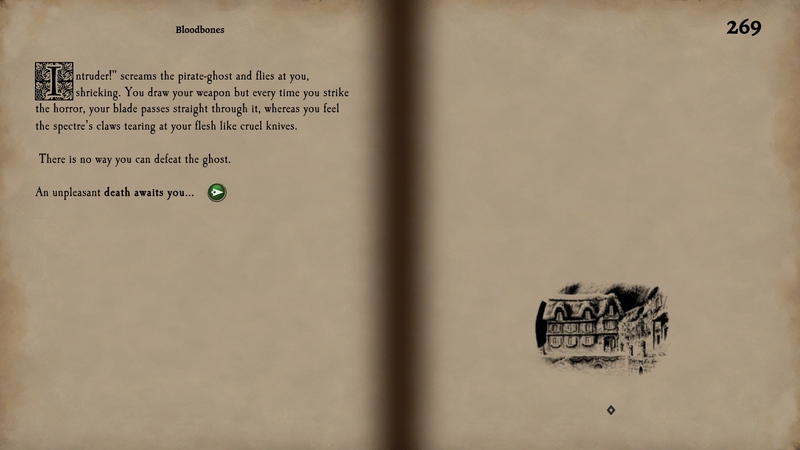 Me, I went with fast dice, as few animations as possible, classic art and page design, just to go full nostalgic on Bloodbones – and I was not disappointed. Not in the slightest. Sure, it wasn’t long before I ended up dead, but that’s Fighting Fantasy for ya. That and… this is definitely where the aforementioned map comes into play, helping me avoid the same pitfalls twice (in theory, anyway). Such a lovely feature. Fighting Fantasy Classics is available on Steam; first book is free while every other carries a $3.99 price tag.